It’s so powerful to understand the context of Over Delivery in your business. As you work toward gaining more word of mouth referrals, operating your business with Over Delivery as a primary mindset is paramount to gaining traction. In fact, it’s the first pillar in your personal CarePackage that I detail in my book More…Word of Mouth Referrals, Lifelong Customers & Raving Fans! Which brings me to an experience I had with my propane company here in Massachusetts. When I purchased my home in 2017, I realized I would need both Oil and Propane. Oil runs the heat in my house, and Propane is used for the gas fireplace and the backup generator. Surely I want to have propane in the tank just in case we lose power in our rural town! The generator was installed by the previous homeowner after the ice storm of 2007 where power was out for 5 days. Yee Haw, that’s rural living! I went to the propane company that owned my tank and met with someone there to set up an account. The tank had been empty for about 9 months, so I made sure to tell them that I wanted it filled when I was home. I wanted to ensure that it was me overseeing the tank fill and not someone else in my home, whom may not have any idea about propane, the tank, the location, etc. My biggest concern was a leak, and even that the fireplace might be on, so when the propane was filled, the gas would leak into the home. I scheduled the delivery for 2 Friday’s from that day, which was roughly 10 days. I specifically chose that Friday because I was away on travel, speaking at 2 events, and that would be the next day that I was home. When I arrived home, I found that the propane company had delivered propane two days earlier. I was rather upset and quite perplexed. I had set up the delivery date, and the ticket that was left for me on my door clearly had the Friday delivery date written on it in large print! In my defense, I wouldn’t describe my conversation at “complaining”. I was truly intrigued as to why the instructions and the agreed upon “contract” wasn’t adhered to. The owner said that the driver was in the area, and thought it would be good to deliver the propane before it was expected. Ah Ha, there it is. They were looking at this from a customer service angle, and were looking to Over Deliver! I love that! Let me repeat…I love that! This is what I want everyone to do. Find ways to Over Deliver. It’s important to keep in mind that there are reasons behind things. A quick phone call to the office, asking why the ticket was marked for Friday, would have likely cleared up any issues in the driver’s mind, and likely would have (I hope) resulted in the delivering being done on the scheduled date. What if by chance I was having work done on the gas lines, and they weren’t going to be ready until Friday. There are so many different reasons why an early delivery cannot be achieved, and I would think that this company would consider all those scenarios, resulting in an internal conversation. Unfortunately, that didn’t happen. This is a perfect case of Over Delivery not being an Over Delivery. In fact, this is an Over Delivery gone wrong! 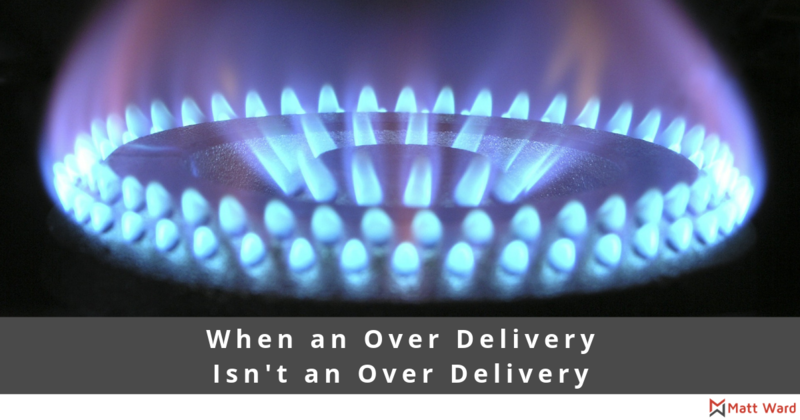 Try to think through the different scenarios in your business around how an over delivery could work, and what the risks are, as well as possibly why and how it could go wrong. I hope that this company has learned from this experience to ensure it doesn’t happen with someone else. If you are ever in a similar situation with your business where an Over Delivery goes wrong, analyze and scrutinize it. Don’t be afraid to ask the customer more questions while explaining to them that you want to fix it and ensure it doesn’t happen again to them or anyone else! If you are unsure if you are Over Delivering or caring enough for your contacts, take the Caring Assessment! and get your personalized Caring Score!